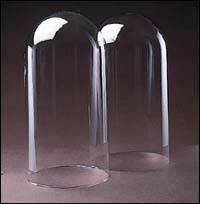 German made Glass crystal domes for Anniversary Clocks in the most popular sizes. Same Day Processing for all Anniversary Clock Domes. German Crystal Dome for 12" Anniversary Clock. Actual Size: 5 1/2 Inches Wide and 10 inches Tall.